Update: You can find a newer version of this recipe here. Oh, I've been such a slacker blogger! The last month has been scary, and not in a good Halloween way. We've been fighting the homeowner blues, replacing both our dishwasher and a toilet, while discovering a few tricks the original contractor left behind. The Kid made it through an egg yolk challenge in preparation for the flu and H1N1 vaccines, but my post on that has been languishing in my drafts file while our computer recuperated from a bad video card in the shop. To top it off I have almost 500 unread emails, while my Google Reader simply imploded once it reached 1000 posts. I am especially remiss in not thanking both Mel for passing on her Splash Award to me and to Marie for gifting me with the especially appropriate Lemonade Award. There's been no shortage of lemons around here. I'll try to catch up to the comments and emails as soon as I can! Sift dry ingredients together and set aside. Cream margarine in mixer, then add brown sugar and beat together until light and fluffy. Reduce speed, then mix in molasses and orange juice. Slowly add dry ingredients and mix until combined. Wrap dough in plastic and chill in refrigerator at least two hours or overnight. Lightly flour one of your pre-cut pieces of parchment paper, and plop about a third of the chilled dough onto the parchment. (Leave the remaining dough in the fridge.) Pat the chunka dough down with floured hands, then roll it out to 1/4" thickness. 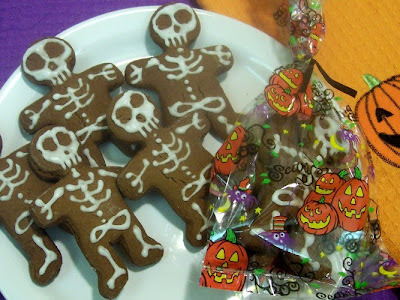 Use cookie cutters to cut out shapes at least 1/2" apart, being sure to leave the cookies in place on the parchment. Carefully remove extra dough from around the cookies and reserve it, then gently slide the parchment paper onto the pan. (Usually I just cover my entire gingerbread cookie with a thin glaze, but since these were "for show" I brushed the excess flour from the cookies with a pastry brush before putting them in the oven.) Bake for 10 minutes. Grab another dough hunk from the fridge and knead it together with the leftovers from your first sheet so that the extra flour is completely mixed in, then repeat the entire process until you run out of dough. Allow cookies to cool completely before decorating. Sift powdered (confectioners) sugar into a bowl, then stir 2 Tbs of lemon juice in with a fork or small whisk. Continue adding lemon juice by teaspoons until desired consistency is reached. Keep in mind that the icing needs to be firm enough to pipe fine details, but thin enough to squeeze from an icing bag without causing your hand to cramp and spasm. Adjust by adding additional juice or sugar. (It took me a couple of tries. 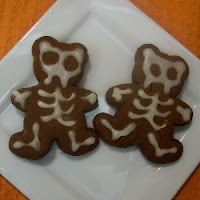 The teddy bears are an example of too thin icing, while the really cute skeletons at the top were hard to squeeze out.) Again, if you've got a white icing recipe or safe commercial frosting that pipes well for you, go for it. I really like the lemon flavor with the gingerbread, but this recipe is also on the fussy side. Unless you're making supersize cookies (not a bad idea!) use the finest piping tip you have to decorate them. I used my No 2. Make sure they dry completely before wrapping or stacking. These little guys were extra effort, but they are a huge hit with The Kid and make fantastic gifts. Quick question? Can your nut allergic child eat nutmeg? I saw it listed in the ingredients for the cookies. Wasn't sure if you just omitted it or actually used it. I am curious because we stay away from this spice. Thanks! My son is allergic to peanuts, not tree nuts, but we avoid them due to possible cross contamination. We've never had problems with nutmeg, but I always thought it was the pit of a fruit (a seed), not a tree nut. I'm most definitely NOT a botanist, though, so I'd suggest giving your allergist a call before trying it. Hi, I came across your blog from the Ultimate Recipe Swap at Life as Mom. I'm excited to find more allergen-friendly blogs! Unfortunately, I can't use many of the recipes on your site because my son is allergic to wheat (as well as dairy, eggs, soy, sesame and beef), but I'm going to post your blog in my links on my own blog so other readers can benefit!